Not a lot of us stop to consider how our household products are affecting the environment, unless of course it has anything to do with our energy bill. But we could always strive to obtain greener products. For example, some homeowners opt to have garbage disposal units installed because they believe it is more beneficial for the environment. They are wise to think so, since disposers provide a great alternative to the use of landfills. Now you can reduce your carbon footprint with the help of the Franke WD75RC. It works quickly to shred hard bits of food waste, so as to also reduce your energy consumption. This is a great way to please Mother Nature! In fact, some disposers even take this one step further by providing a more nature-friendly form of service. 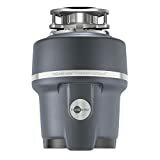 One good example is the Franke Garbage Disposal WD75RC WD Food Waste Disposer. On this guide we will explore all of its capabilities, pros and cons. We will also discuss how this model makes Mother Nature happy. All you have to do now is read on. The Franke Garbage Disposal WD75RC works in such a way that it slightly reduces your carbon footprint. The unit does this by providing a quicker grinding service than most other models. Think of it this way: the faster your task is over, the less energy consumed. So it gives you two, simultaneous benefits: it reduces your energy bill, and it also makes Mother Nature proud of you. It is also impressively powerful, working with a 3/4 HP permanent magnet motor, instead of an induction motor. This said D/C motor is at least 3 pounds lighter than their induction counterparts, this explaining the speed. This also translates to at least 30 percent more torque, which ultimately results in an outstanding shredding performance. This Franke Garbage Disposal is pretty straightforward. It does not offer a lot of additional features to get potential buyers hooked. It also doesn’t try too hard to get your attention. The only real bonus that it gives is its compatibility with septic systems. It’s a perfect match for households using a septic tank. Other than that, it doesn’t offer much more. It relies solely on its powerful 3/4 HP permanent magnet D/C motor and incredible speed to catch your interest, so if you are a straightforward buyer, then this would please you just fine. One reason you may opt for this Franke Garbage Disposal is because it is a bit cheaper than your regular 3/4 HP disposers. This is currently sold at a price of almost $150 dollars, which only goes to show that you don’t have to pay over $200 dollars for a powerful grinding unit. With its speed and performance, complemented by its impressive price tag, this Franke Garbage Disposal promises to please not only the environment, but also your wallet. Even the installation process is lauded by reviewers because it is easy to hook up to your sink. The only drawback is probably its lack of additional features, but that doesn’t really matter if you are only after a good shredding service.